Automatic Thread Trimmer with Suction Device Overlock Sewing Machine Top and Bottom Feed EXT Series. This machine is an intelligent top and bottom feed super high speed overlock sewing machine with a mechanical, electrical control integration technology. 3. With safety switch function. When threading and cleaning the machine, only after opening the presser foot or sewing table, it will start automatically, and the machine will stop working to protect the operators' safety. 4. With the attractive appearance integration operation panel with Chinese language. The function of different sewing option, choosing infrared light, thread cutting selection, suction device selection, pressure foot lifter selection, needle position selection, speed adjustment, LED brightness adjustment and other functions can start fast with one button. 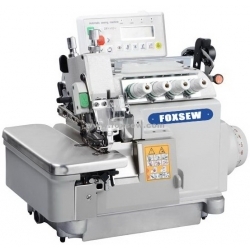 This new generation overlock is a combination of precision machinery and electronic technology. It is widely used for the joint seaming and decoration seaming on various materials, such as general garments, underwear, bedclothes, thin package and leather products, there are many different stitches for your selection. The thread tension is easy to adjust to achieve better sewing quality. The highest speed is up to 8000rpm, it greatly enhances the production efficiency. The needle bar inbuilt is to prevent oil leakage, meanwhile, the components are specially designed for anti-friction, more wearable and enduring, save the maintenance, save your cost. Equipped with the brand-new automatic infrared sensor device, no need to step on the pedal, will save the effort, and make the operation more easier. The newly researched pneumatic foot-lifting device, can lift the presser foot easily and automatically, save human labor, save time.removed hang type motor, enlarged operation area, with inbuilt direct-drive device, the machine would be more intellectual, and energy saving. Thus, it greatly improve the product efficiency, and reduce the operating cost. Vertical knife structure, combined with photo sensor, can start to cut automatically when needed, it greatly increased he work efficiency. The air suction inlet is set at the back of presser foot. Through air absorptive power, it can inhale all the thread ends and cut the threads. Adopting oil filter device, ensures oil clean, guarantees the products' high speed operation, cleaning the filter and changing the filter core regularly is good for prolong the service life.